If you’ve been reading the comments, you know that the 22nd European Photovoltaic Solar Energy Conference and Exhibition has been confirmed for the FIERA MILANO – Exhibition & Convention Centre in Milan, Italy. Abstract submissions for papers from aspiring authors are due by January 29, 2007. Authors should preview and use the Online Abstract Submission form keeping in mind an abstract file upload is expected. 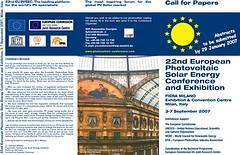 For further information, prospective authors should download and review the 22nd EU PVSEC Call for Papers. I am thinking about topics for a paper myself. If I submit an abstract, I will post it to the blog, approved or not. I plan to make my arrangements for the 22nd EU PVSEC early next year. If you are looking for information about Milano, I suggest checking the Milano Tourist Office and the Milan Travel Guide from the New York Times. I look forward to visiting Milano for the second time. Why does every language like to rename places even when they use a similar alphabet? In my language scheme, local names would always be spelled and pronounced in the native tongue. Forget Milan and what’s up with the German name, Mailand? Sounds like an Italiano coffee drink. Ciao! EU PVSEC News and Happy Holidays! I decided against submitting an abstract for a paper at EU PVSEC in favor of another project. I just hope I have the discipline to execute on this project without external deadlines.